Ever been in a tall building on a windy day or had an aircraft pass over your house? Along with the noise that you hear, which can be disruptive and unpleasant in its own right, you’ll also notice some low-frequency vibrations that can ultimately affect the structure’s stability. One solution to this problem is to incorporate dampers, particularly viscoelastic structural dampers, into the structure’s design. With simulation apps, the path to optimizing these devices is more efficient than ever before. To begin, let’s consider a famous case of a structure affected by vibrations. The London Millennium Footbridge, as it is officially known, is a steel suspension bridge that allows pedestrians to cross over the River Thames in London. 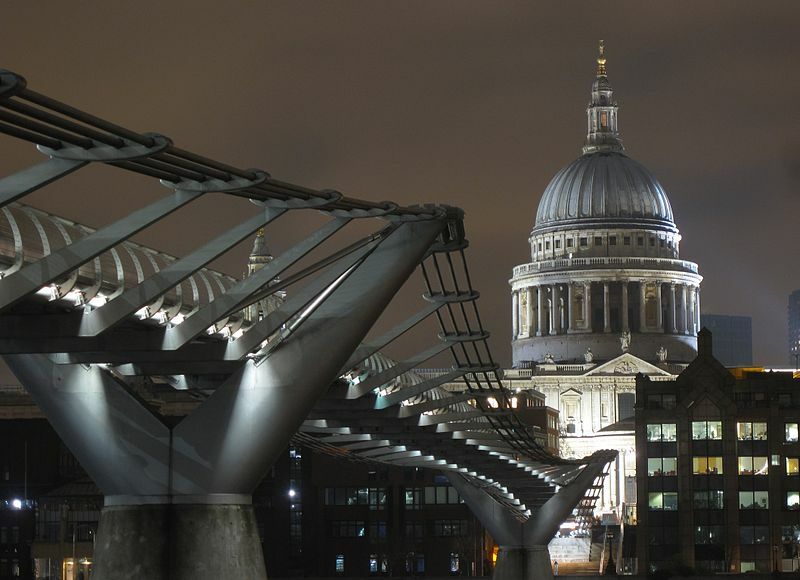 Locally, however, this structure is often referred to as the “Wobbly Bridge'”. The London Millennium Footbridge. Image by Rup11 — Own work. Licensed under CC BY-SA 3.0, via Wikimedia Commons. Just days after opening in June 2000, the footbridge was closed, as pedestrians’ footsteps produced vibrations that caused the bridge to sway from side-to-side. The unconscious tendency of pedestrians to match their footsteps with the sway of the structure only worsened matters. The bridge itself was closed for almost two years, with design modifications implemented in order to counteract such vibrations. The solution: Install dampers within the structure’s design. Dampers are an important element in the design of structures, as they help to prevent damage resulting from vibrations due to seismic waves or wind. By doing so, these devices serve as a powerful resource for protecting the longevity of various structures. Consider, for example, a tall structure like a building. In such cases, dampers that consist of layers of viscoelastic material are often introduced into the design as a means of protection against vibrations. The viscoelastic material (shown in red in the image below) will absorb the vibrations from the mounting and dissipate the mechanical energy as heat. This means that the low-frequency vibrations resulting from seismic waves or wind will be less noticeable and less likely to cause structural damage. A schematic of a viscoelastic structural damper. With the goal of developing impactful infrastructures and buildings that meet safety requirements for withstanding low-frequency vibrations, viscoelastic structural dampers are a valuable resource to designers. Before these devices can be incorporated into a structure’s design, there is, of course, the need to verify their effectiveness. With the Application Builder, ensuring that these requirements are met has evolved into a much more streamlined process. 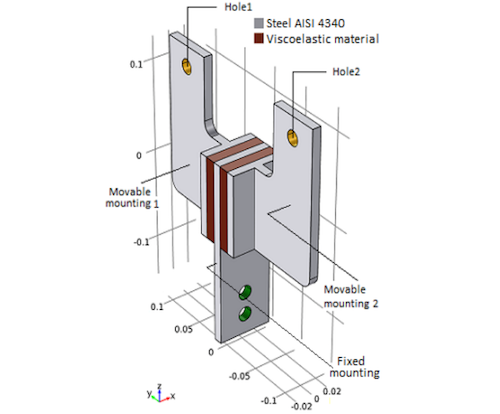 Our Viscoelastic Structural Damper Analysis app offers insight. Simulation apps are all about customization. When building an app of your own, you can tailor its design and layout to correlate with your specific analyses. The result is an easy-to-use tool that those with little simulation knowledge can use to set up and solve their own simulation studies. The Viscoelastic Structural Damper Analysis app is designed for users who wish to model the transient and frequency response of a certain structural damper type given different viscoelastic materials and loads. To determine the effectiveness of the damper’s ability to dissipate energy, the app shows results for important parameters such as the hysteresis loop, loss and storage moduli, and displacement. User interface (UI) of the Viscoelastic Structural Damper Analysis app. 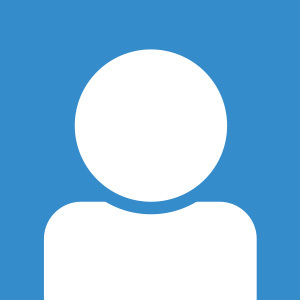 The app’s UI, as shown above, is broken down into a series of sections that allow users to easily navigate through the tool and find the information that they need. The Ribbon section features six buttons. These different buttons give users the ability to easily toggle between frequency-domain and transient studies. They further enable them to reset input fields to their default settings, create an animation, access app-related documentation, and generate a report composed of model information and simulation results. Within the User Input section, you will find a number of different parameters that can be modified. Users can, for instance, specify the viscoelastic material model that they would like to use in their damper simulation, with the option to compare results using two different material models as well. They can further define the magnitude of the forces in the holes along with their phase angles. In addition to a sketch that shows the damper’s geometry and respective materials, this section also includes additional input options that are tailored to the different types of studies. For the transient study, users can adjust the frequency of the load and the number of cycles to be analyzed. Similarly, for the frequency-domain study, they can select the range of the frequencies. Located on the rightmost part of the app’s interface, the Results section is comprised of two tabs that show the results for the transient and frequency studies. The changes that occur within these tabs relate to whether the simulations involve a single model or the comparison of two material models. 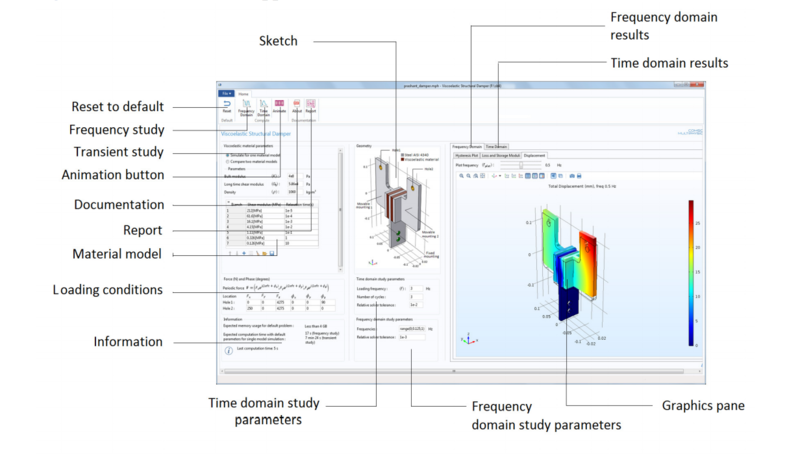 While their layout is simplified, simulation apps still exploit all of the visualization features available within COMSOL Multiphysics, presenting results in a clear format that is easy to communicate with others. Running simulation studies is no longer limited to those with simulation expertise. With apps, it is now possible to spread simulation capabilities to a wider audience. As the creator of an app, you have full control over the features and functionality that are included in its design, customizing it to fit your necessary requirements and thus optimize your overall design workflow. To start experiencing the benefits of designing and deploying computational apps, use the resources below as a jumping-off point.